MAM at Kolkata hosted Durgapuja, the biggest festival of Bengalis, as Durgotsav. A three feet idol of goddess Durga was enshrined in a beautifully decorated shrine and daily worship was done in the traditional way. The response from the public was beyond imagination – approximately two thousand people visited during the four days to worship their beloved deity. The praise was unanimous – ‘goddess Durga’s face was extra-ordinarily beautiful!’ Traditional ‘dhak’ (a percussion drumming) music had added a genuine local flavour. The recitation of Devi Mahatmyam on all days was a special attraction. In addition to chanting of Lalita sahasra nama and Mahishasura mardini stotra the devotees sang bhajans on every day. 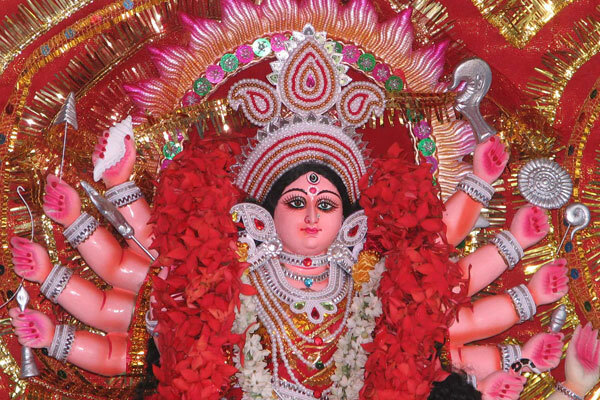 Various pujas were conducted during the celebrations, the last being Saraswati puja on Vijaya Dashami day. Some children were initiated in to the alphabets during Vidyarambham.